Part of the fascination we have for antique carpets is their history. For the most part, we get new rugs in all the time and know pretty much immediately where they where and when they were woven. We can also figure out what is the significance of the imagery and sometimes we even know who made it. 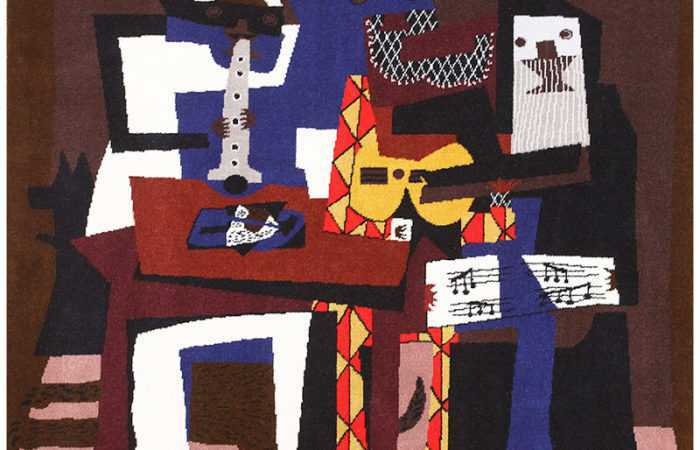 Unlike paintings and other forms of art, rugs were seldom signed by the artists themselves. Even when they were signed by the artist, there is very little paper trail for us to follow if we wish to learn more about the person who created it. 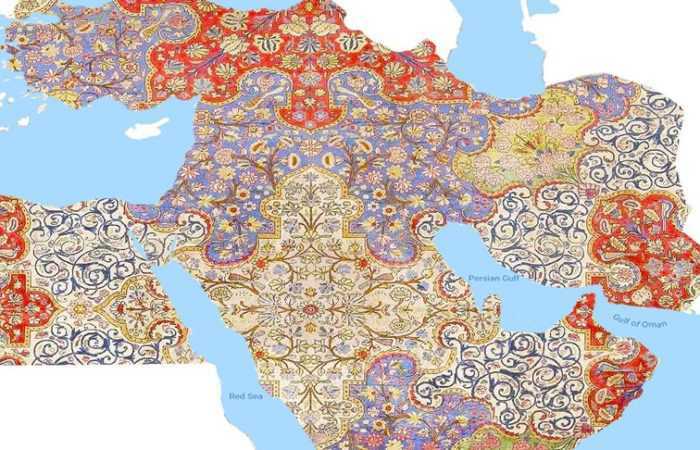 For the most part, the rugs are named based on the location from which they came. For example, antique Persian Tabriz rugs are antique Oriental rugs that were woven in the Persian city of Tabriz. There are only a few rugs that are named after the artists themselves (like the Kermani rugs which were created by Aboul Ghasem Kermani). But once in a while something comes in that is not as obvious (like the mystery rug we wrote about a few months ago). In such cases we need to embark on a journey of discovery to try and figure out what we have found. This week we happened to acquire a couple of magnificent Israeli Marbediah rugs. While we knew exactly where they were woven and when, one of these Israeli rugs featured a design that threw us for a little loop. At first glance, we thought this piece featured the iconic The Dome Of The Rock which is located at the Temple Mount in Jerusalem Israel. But the more we looked at it, the more we started doubting our initial gut reaction. Somethings about the rug design, like the configuration of the architecture and the palm trees in the foreground, just seemed off. So what do we do these days when we need to draw on the collective for help? We turned to Facebook of course. 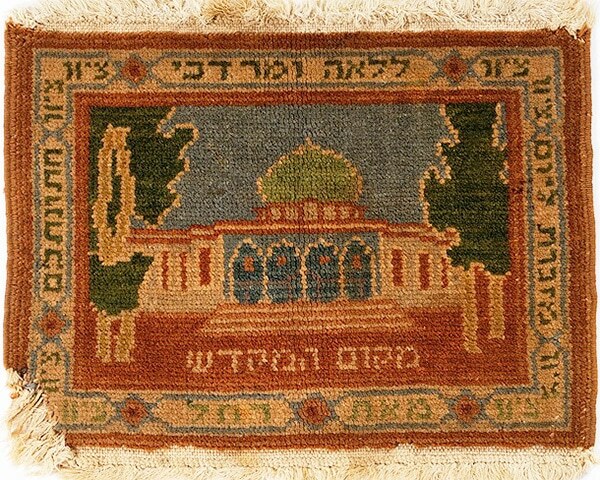 As luck would have it, Omri is originally from Israel and as such has many friends and acquaintances and surely at least one would know right off the bat what location is depicted in this little artistic rug. So he posted the link and image and within minutes people started chiming in, but they too seemed a bit perplexed by this image. Some thought is was a depiction of the Dome Of The Rock, others felt it was far more inline with Church Of The Beatitudes which is located near the Sea of Galilee. Other speculative commentators chimed in and at some point a seesaw debate started taking shape. Who would prevail? 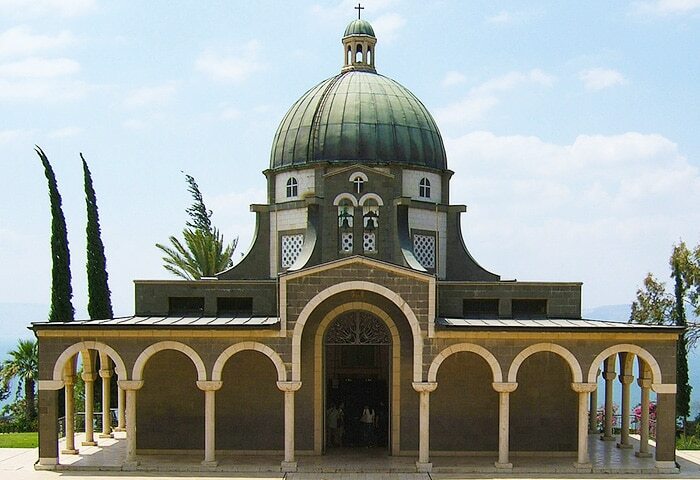 Would it be the Dome Of The Rock or the Church Of The Beatitudes contingency that would be correct? Luckily enough, one of the people who had been made aware of this debate happens to be an expert in Israeli locations. He immediately concluded that it was in fact the Dome Of The Rock but from an angle we don’t usually see. The pillars in the front of the illustration, based on his assessment, were not from the from entrance. These pillars are actually located on the western side of the structure. The image provided seemed pretty compelling but there was still a lagging sense of doubt. Until he followed with yet another image that sealed this beautiful rug’s fate. 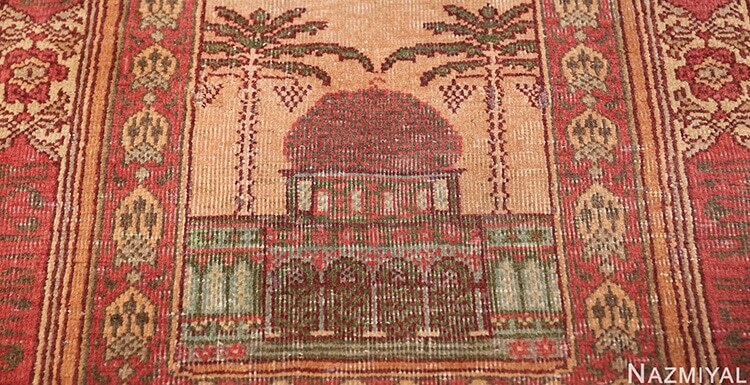 He provided an image of a similar piece, that was woven at the same time and was also created in the Marbediah workshop. In this image (as you can see above) there is writing that accompanies the imagery. The writing right under the image itself reads in Hebrew: “Makom Ha’Mikdash” which translates to “The Place Of The Temple”. 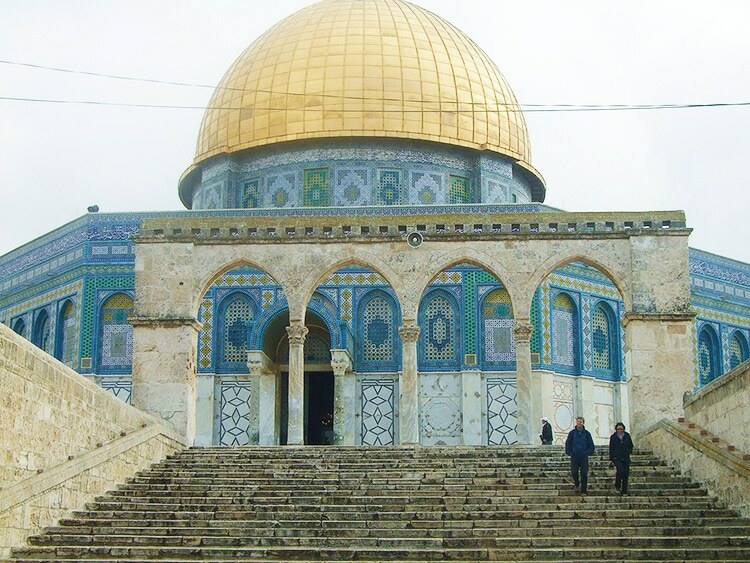 Since it is an undisputed fact that the Temple of Solomon was in fact located in the Temple Mount, the imagery would have had to be that of the Dome Of The Rock (from the western angle depicted in the above image). Unraveling the the meaning behind certain pieces is a fascinating and integral part of what we do. Naturally, like any expert in any field, we rely on others for help when we come across something that is a little tricky to pin point. In this case, we would like to thank the panel of Facebook mavens who were gracious enough to help us go down the rabbit’s hole in search for the true meaning of the magnificent work of textile art. 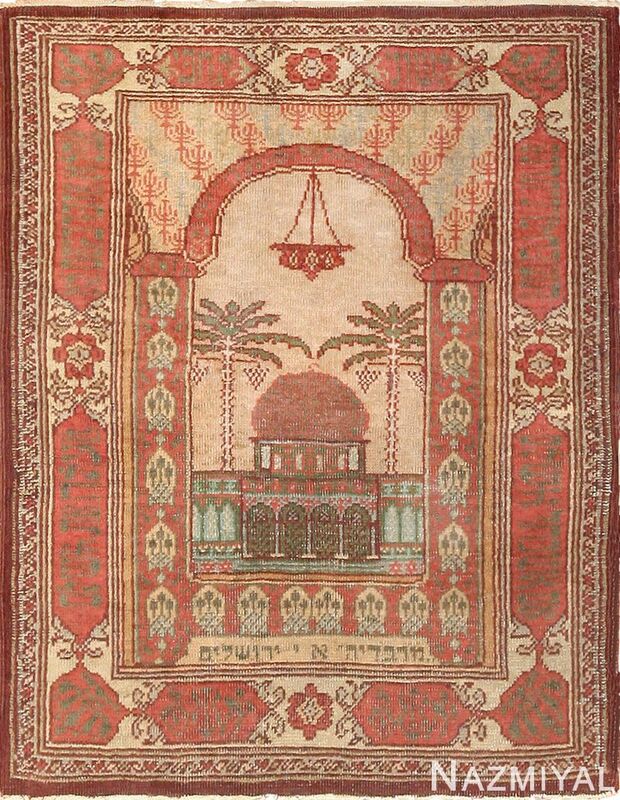 This rug blog about the Marbediah Dome Of The Rock Rug was published by Nazmiyal Antique Rugs in New York City.